Yes, you read that right. Eggplant for dessert. 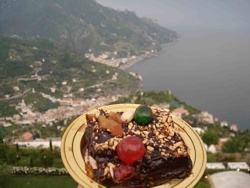 Popular throughout the Amalfi coast during the spring and summer, melanzane al cioccolato is always served on August 15th, to celebrate Italy's national summer holiday Ferrogosto. Layers of eggplant are spread with chocolate sauce, then refrigerated and served icy-cold. The eggplant plays nicely against the sweet dark chocolate sauce. This recipe is courtesy of Salvatore De Riso, one of Italy's best-known pastry chefs. Peel and thinly slice the eggplant. Fry them in oil, drain on paper towels, and allow to cool. Meanwhile, to make the sauce: Combine the condensed milk, sugar, cocoa powder, cornstarch, and 7/8 cup of cold water in a medium saucepan. Whisk until all the ingredients are well combined. Heat over medium-high heat until the mixture boils, then reduce the heat to medium, and stirring constantly, low boil until the mixture thickens, about 3 minutes. Allow the mixture to cool for a few minutes then stir in the butter and chocolate until melted. Dip each slice of eggplant in the sauce and layer onto a serving platter or baking pan, as you would for lasagna. Top with the remaining sauce, candied fruit, and nuts. Refrigerate and serve icy cold. *Concerto is a liqueur of the Amalfi and Naples region created centuries ago, that's still popular today. It's made with a "concert" of spices and orzo, a grain commonly used to make a caffeine-free coffee substitute. As with all recipes Italian there exist hundreds of slight variations. At the lovely Hotel Caruso in Ravello, Chef di Raffaele poaches paper-thin slices of eggplant in white wine. He then rolls the slices in delicate light ricotta mousse and tops the dessert with melted dark chocolate.